Lyle: Over the next few weeks of lessons you will learn several different styles of music. Tonight is the Blues! Lyle: It is "essential" that you learn to play several styles of music on your guitar so you can be a better all around musician. Lyle: Most blues progressions have three chords, the 1 - 4 - 5 chords of any key. Lyle: The blues progression you'll learn here is in the key of E.
Lyle: The first rhythm pattern I want to show you uses all upstrokes on the "upbeats". Lyle: This means you count 4 beats per measure and count 1 & 2 & 3 & 4 & and strum up on the &. Lyle: Try to mute or muffle the strings during the down beats, which are the 1 - 2 - 3 - 4. Lyle: Playback the TAB so you can see and hear the rhythm riff with the music. zz: can we throw some 9th chords in to spice it up? 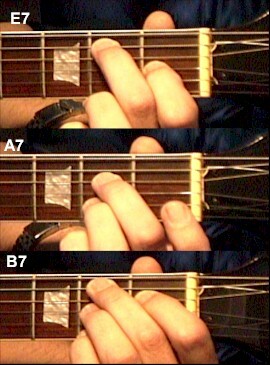 Lyle: If you want to play blues riffs over the rhythm, you'll need to know a couple common scales to use. Lyle: Here's a solo that has many blues riffs in it. Lyle: It repeats the intro riff 4 times before it changes to the minor pentatonic . Lyle: Notice the place where the solo changes to the minor pentatonic. This is during the first chord change, when it goes to A.
Danny: but you still play Em scale? Danny: instead of A or something? zz: looks like you are using part of Dorian mode? Lyle: The major 6th is there from the Dorian, yes. dan: What scale are you playing before the minor pent - the mystery one you mentioned earlier? Lyle: This blues solo and rhythm riffs are from one of the lesson series called Jam Sessions - All Blues Styles. If you like this lesson you will like those too. Lyle: Yes, you can play the Em pent over the A9 chord in this case. Lyle: At least learn the rhythm riffs so you know how to play the blues for the next time you get a chance to jam with someone. Lyle: That's about it for this lesson. Lyle: Next week I'll show you a different style of music to learn and play. Lyle: I don't know what style it will be, I'll have to see what I feel like jammin' on!